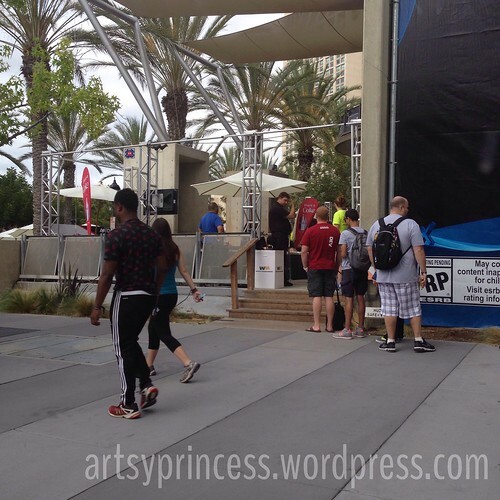 Comic Con 2015 – Recap with Pictures! | Living life in the carpool lane..
I’ve always wanted to go to Comic Con. In the past, when it was Comic Con weekend, I always found myself out of town. Not this year. This year, we were home. While we didn’t have any badges to enter the actual convention, we did go down to the Convention Center to see all the fun festivities that happen outside the actual Con. We thought we got there early enough to get some parking relatively close. We were wrong. We ended parking about a mile or so away from the Convention Center. I didn’t mind the walk. My Fitbit was happy with all the steps I had that day. Once parked, we loaded the girls into the double stroller. Did we dress up?! Sorta. The girls wore character shirts. 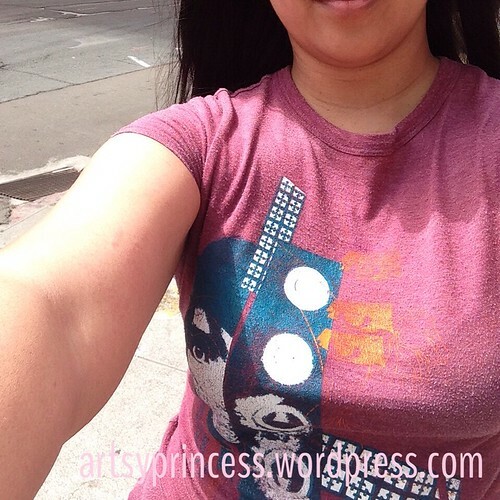 M wore a My Little Pony shirt. K wore a little pink Superman shirt. Hubby dressed up as a can on Coca-Cola. 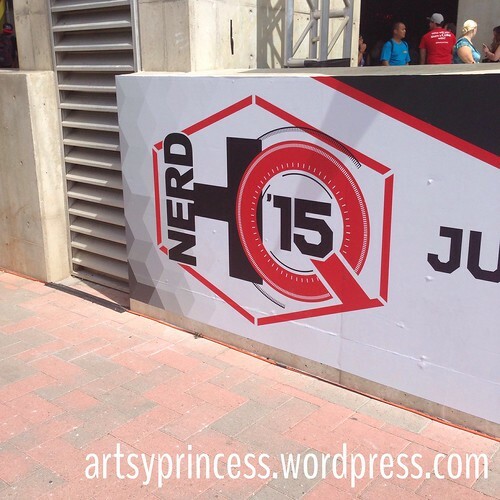 As we walked toward the convention center, we stopped by Nerd HQ. Honestly, I don’t really know much about Nerd HQ. I believe it was a free event. If we didn’t have the double stroller, we would have gone in and checked it out. It was located inside a children’s museum with a little park area on the outside, so we stopped for a bit to let M stretch her legs and enjoy some of scenery. This area had a box of chalk that anyone could grab to draw on the wall or the floor. M had lots of fun seeing all the awesome drawings. She even took a few photos with some. 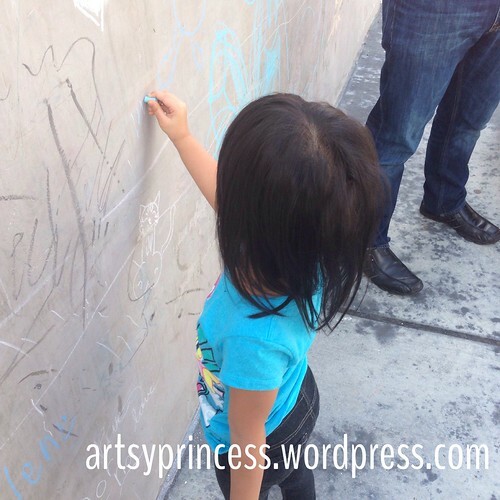 She also enjoyed being able to draw on the wall too! MOMFAIL Moment: When M was done playing, we put her back into the stroller and proceeded towards the convention center. We ended up walking behind two ladies dressed in full Frozen’s Anna and Elsa cosplay. M was in awe. She has never been up close to Anna and Elsa before. They heard us talking about them while we were stopped at a crosswalk because they suddenly turned around and starting talking to M! She was all smiles as she answered their questions about her shirt. Once we were allowed to cross the street, they said their good byes and M was just on cloud nine. I WISH I ASKED THEM FOR A PICTURE!! Even as I type this, I feel like kicking myself in the face for not asking to talk a picture with M. I saw them take a picture with another family and I was so disappointed in myself for not asking for M. She has the memories, which I hope she will keep with her for a long time. After the whole Frozen experience, we found ourselves at the Convention Center. It was amazing! So many people in costume. M had a blast seeing all the people in various cosplay. Hubby recognized more characters than I did, but it was just a total blast to see. It was a bit difficult to navigate with a double stroller and I felt like we were blocking a good section of the walkway, but we tried our best to move along and not get in anyone’s way. After we walked the front of the Convention Center, we made our way to the Gaslamp District where there were TONS of different events going on. I was in awe of all that was happening that I forgot to keep taking photos. We enjoyed the people watching so much that I want to make it an annual ‘thing’ for our family to do. Hopefully, one year, we’ll be able to get badges and actually go inside, but for now, I’ll settle for hanging in the outskirts. 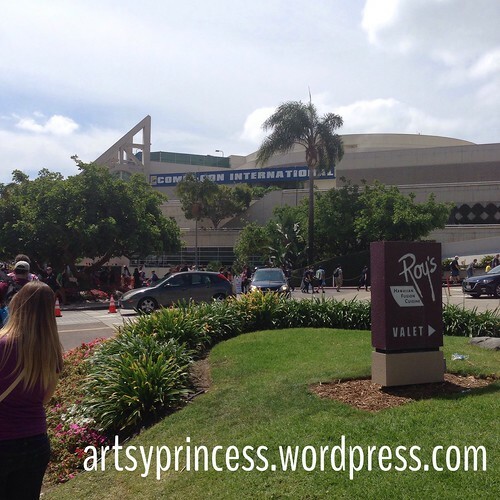 Did you go to Comic Con this year? How did you like it? Did you dress up? I’d love to hear some fun Comic Con stories from you in my comments!